Just depends on the store. Some are helpful and honest and others are very touchy about it. My Target had the FdC play set with Rochelle marked down to $19 and some change. They were on an aisle mostly dedicated to clearance away from the doll section. There had to be at least 10 sets. 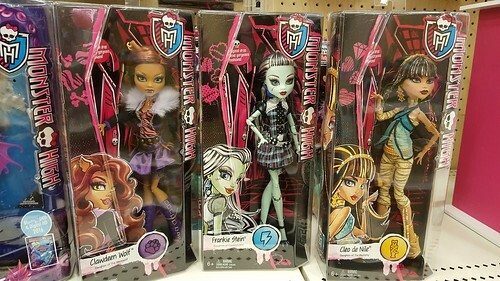 The Frightmares had been marked down to $6.98 but they were on the doll aisle with the clearance Spring Unsprung dolls. So jelly. I want that Rochelle but couldn't justify a whole playset. Maybe our target will have some when I get paid again. The Frightmares were marked down to about the same price here as well, but other than that, the aisle was barren, just utterly gutted. I would have thought they were in the middle of a reset, but nope. Just... ravaged. I hope we get new stock in soon. They had some of the WTW Lizzie sets marked down to around 20 at ours, but I don't EAH. 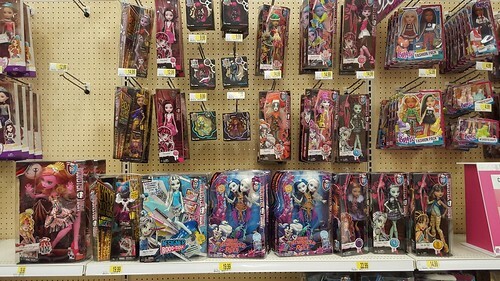 Some of the newish vinyls were out, including a couple chase's -Venus and a Draculaura (I know she's not NEW new, but I hadn't seen any of the varients in the store before). I really dislike our singular Target. I found somethings I liked but I really want Freak Du Chic Clawdeen. My Target reset! The new EAH characters (Farrah and Justine, there was no Melody) were $15. Forgot to check Teenage Evil Queen but I think she may have been $20. She's 20$...they didn't mark the playset down any further yet at ours. We have two + a lot of Scaregrounds left. I managed to grab the last FDC playset in San Ramon, CA for $11.98! That's an awesome clearance price. They still haven't marked the playsets down to 11$ here, but we did at least get the other two Ghouls Getaway dolls. Target in Latham, NY had loads of new stuff. Birthday Rosabella, all the Ghouls Getaway dolls, Courtley & Mira, and the less-articulated EAH & MH. The EAH ones were $7.50, and I almost got them, but they didn't really "speak" to me so I left them there. I wanted to get that Rosabella but my budget wouldn't allow it. Does anyone know if GG Elissabat and Jane are Target Exclusives. They have a different assortment number from the other 3. Also I'm wondering if Courtly is one too because I haven't seen shelf tags for her anywhere else. Yes to GG Elissabat and Jane. 10% of both Monster High and Ever After High dolls using the Cartwheel app! I found Melody at a Target in Orlando today! I was so excited to finally see her in person. Unfortunately she was $20, so I passed on her. I found them over in Pennsylvania, today, too! I held off because I'm really hoping to find the "fishified" Draculaura, so I hope this bodes well and is a sign that other stores will start stocking the lower-end mermaids, too. Isn't she Walmart exclusive or was that just Clawdeen. They both are, but I haven't seen any of the 14.99 dolls in my area yet! do you have the DCPI? My Target had the BYBY Frightseers on clearance for $7.48, along with some of the Bratz dolls. The new Backyard Beach Bash dolls were $11.48.